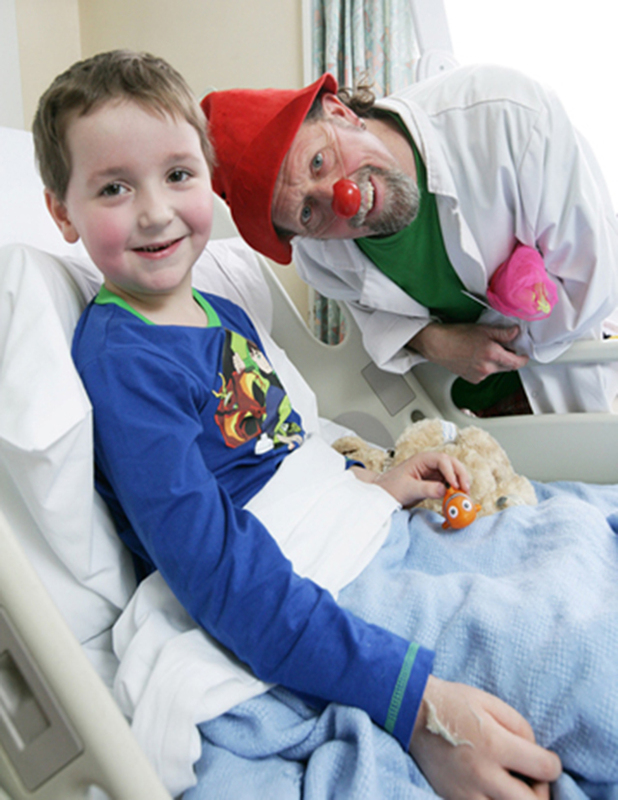 Image: The Northern Ireland Clown Doctors bring smiles, laughter & fun to children & young people undergoing medical treatment in hospitals & other health care settings as part of Arts Care’s programme, supported by the Arts Council's National Lottery funding. The Northern Ireland Confederation of Health and Social Services is hosting a reception in the Long Gallery, Parliament Buildings to mark the 70th anniversary of the Health Service today, Thursday 5th July. Northern Ireland Poet, Colin Dardis will perform his brand new poem, “Confidence”, commissioned with support from the Arts Council of Northern Ireland, especially for the occasion and colleagues will be welcomed to Stormont by a big “Carpet of Care” - an art work created by Arts Care working in partnership with the Pushkin Trust, involving over 300 clients and volunteers from Strabane. To formally mark the occasion, representatives from across the political spectrum, patients, clients, staff and charities have been invited to join together at Stormont to celebrate. As part of the celebrations guests will hear stories from across the generations about how the Health Service has touched their lives. There will be dancing from Orbit Dance Company, a group of service users and healthcare staff from Belfast Health and Social Care Trust, singing from a children’s choir from the Northern Health and Social Care Trust, and everyone will help eat a big “NHS” letters cake. At the reception Sharon Gallagher, Deputy Secretary for Transformation at the Department of Health, will present seven people from Northern Ireland with certificates. These staff were nominated by their peers in a UK wide campaign, ‘Health and Care’s Top 70 Stars’ and were successful in being included in the overall list of 70 out of 236 nominations. Sharon said: “Today’s event reinforces the importance of our people in delivering real change. Seventy years ago, the NHS brought together people like those here today, for the first time, as one giant UK-wide organisation. That was a huge forward-thinking, innovative and collaborative step. Seventy years on, we have re-committed to that founding principle of integration, and I have no doubt that it will help us to create a new system which delivers first class services which will be sustainable for another 70 years and beyond. This celebration is one of hundreds right across the UK. Across Northern Ireland, each Health and Social Care organisation will be hosting their own celebration and 1000s of people will be drinking tea and eating cake. Many partner organisations will also be showing their support– some even lighting up their buildings in NHS blue when it gets dark later this evening. we will meet the needs of every patient. what do these three simple letters suggest? to the person who answers your SOS. in between the scans and the labour pains. that extra pillow while we convalesce. take two in the morning; at night, repeat. means seven more secured decades of growth. this jewel in our crown, it’s the N-H-S.